Children will love wearing this oversized necklace. 1. Gather your materials. 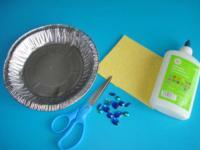 You will need an aluminum pie plate, scissors, shiny Fun Foam, white glue (or hot glue), and plastic gems. 2. 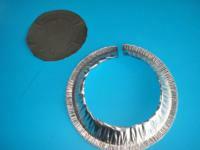 Remove the centre of the pie plate and cut out a section of the edge as shown. 3. 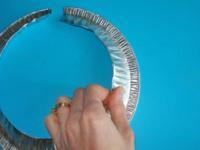 Fold the centre edge down so that it won't scratch or hurt the child's delicate skin. 4. 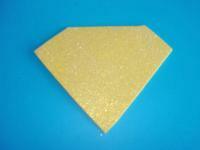 Cut a large gem shape out of the shiny Fun Foam. 5. 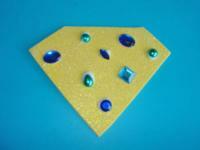 Glue plastic gems on the Fun Foam. With very young children, you may use stamps or markers instead of tiny gems. 6. 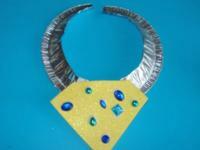 Glue the large foam gem at the bottom of the necklace and it is ready to be worn!